NEW YORK – Every time that the Thunder steps on the floor, there’s a level of pride that swells up to help the team deliver its best, representing the “Oklahoma City” printed on the front of the jersey. For nearly the entire time the team has been in Oklahoma, it has had the honor to play on Christmas Day, and the team has had countless opportunities on national television. But on Monday afternoon there will be a different kind of pride as the Thunder heads to Madison Square Garden to take on the New York Knicks on Martin Luther King, Jr. Day. The Thunder is already riding a high coming in off of a dramatic last-second victory over the Philadelphia 76ers, when Paul George completed a four-point play after a made three and a foul with 5 seconds to go. 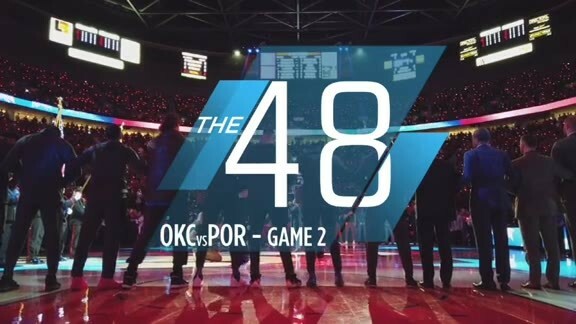 George scored 31 points in the game, including 14 in the fourth quarter, to cap a wild finish and bring the Thunder up to 27-18 on the season, 4.5 games out of first place in the Western Conference. 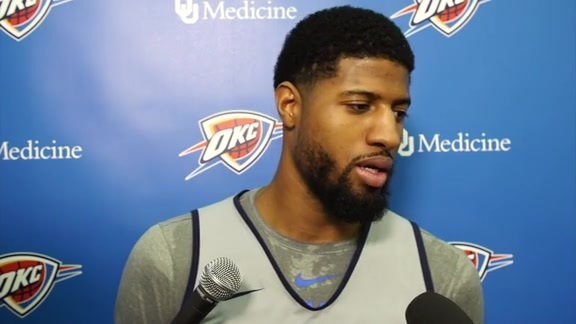 All season long, George has dazzled for the Thunder, scoring off of drives with either hand and hitting 38.6 percent of his career-high 8.9 three-point attemtps per game. An area where George wants to continue to improve, and hopes to utilize in Monday’s game against the Knicks, is his mid-range game. Over the years that has been one of George’s most prolific spots to shoot on the floor. This season, around 35 percent of George’s shots have come between 3 and 22 feet, from just outside the restricted area out to the three-point line. He’s shooting a career-best 44.9 percent on shots from 10-to-16 feet, and 39.4 percent on shots between 16 feet and the three-point line. If opponents like the Knicks are going to pack the paint to protect the rim and close out hard to the arc, George can have a field day in at the elbow areas. The man who consistently provides George with openings is Steven Adams, the burly Kiwi center who sets crushing screens that block out any chance for a defender to get back in front of George, Russell Westbrook or any other Thunder ball-handler. In return, both George and Westbrook have rewarded those screens with some beautiful lob passes for alley-oops, which Adams has flushed with authority. Lately the Thunder’s offense has been humming scoring over 117 points in each of the last six games. In order for the Thunder to have success against the Knicks and complete this holiday weekend sweep, however, the Thunder’s defense will have to stand tall. The Knicks are a young bunch who are attempting to play an up-tempo style with rookie Kevin Knox and young guards Frank Ntilikina, Emmanuel Mudiay, Tim Hardaway Jr. and Allonzo Trier. To get a win, the Thunder’s defense will need to play together with focus and discipline for 48 minutes, balancing strong close outs to the perimeter with good contests, without fouling. 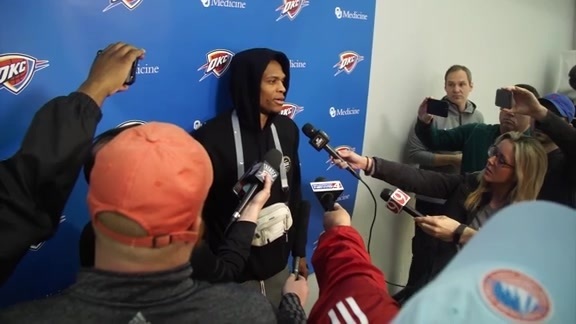 “Just getting out, closing out to the shooters, making it tough for them,” said Westbrook. - Terrance Ferguson hit a huge shot down the stretch against Philadelphia, another make from three that is adding to barrage he’s created for the Thunder lately. Since a rough shooting start to the season, Ferguson’s percentages have increased exponentially from 33.3 percent in November to 36.7 percent in December to an incredible 49.0 percent so far in January from behind the arc. - Part of the reason for Ferguson’s growing three-point marksmanship is the trust the Thunder is showing one other on the floor. Playmakers are creating open looks for everyone and completely buying into finding the best shot, no matter who is taking it. Over time, that confidence permeates through each guy who touches the ball. - On Saturday, Donovan made sure to match Adams and Ferguson’s minutes, respectively, with 76ers players Joel Embiid and JJ Redick. Much like he’s done by getting creative with the timing of George and Westbrook’s court time and other substitutions, Donovan showed some crucial flexibility against a high-level opponent. Moving forward, keep an eye on other moments when Donovan leverages the talent he has to maximize what the team gets done against the opposition’s best performers. “For us to keep Steven, Dennis (Schröder), Paul, Russell on the floor, rotating and moving those guys around is important,” said Donovan.